Then I married a man who had grown up with pine Christmas trees, often flocked (sprayed with fake snow, for those who aren’t old enough to remember). He also hated tinsel and thought that mini lights looked best, even though they had pink bulbs along with the traditional red, blue, green and white ones. I thought it was borderline sacrilegious to put pink bulbs on a Christmas tree, and as far as I was concerned, pine trees didn’t smell like Christmas. Compromise was slow, but inevitable, and eventually I stopped hanging ornaments by size, bought an artificial tree so it could go up shortly after Thanksgiving, and gave up on the need for tinsel. I still cling to my old-fashioned lights and glass ornaments, and no tree of mine has ever been “flocked.” We now have trees (two: a real tree in the basement and an artificial tree in the living room) that we both like. I remember being a bit annoyed with my husband when he first questioned the Christmas tree decorating rules I had been raised with, and for many years I insisted on adding plastic tinsel to our trees, even knowing how much he disliked it. (The living room windows in our first apartment were so drafty that the tinsel on our tree was usually swaying in the breeze, which I thought just added to the charm.) For me, Christmas was all about tradition, and I wanted to stick with the traditions I knew best, even when they didn’t really work anymore. It took a long time before I realized that traditions are important, but they aren’t nearly as important as making the people you love happy and doing what works best in the here and now. Over the years, husband and I have learned to compromise on nearly all of our holiday traditions. When we were married but childless, we drove over 500 miles each Christmas to make sure we spent Christmas Eve and Christmas day with our parents and extended families. When the kids came along, that didn’t work anymore, and we began to stay home for Christmas morning. Now our kids are adults, one married and one engaged, and our Christmas celebrations continue to change as we figure out what works best for everybody each year. And that’s as it should be. I will always be a fan of holiday traditions, but I no longer make the mistake of thinking that keeping those traditions are the most important thing. My Christmas trees may not look exactly like the ones in my childhood, but I still think they are beautiful. And my family may celebrate Christmas a bit differently each year, but we still have a wonderful time together. The best traditions, I think, are the ones that are flexible enough to include everybody. That being said, I’m still not ever going to have pink lights on my Christmas tree. There’s such a thing as too much compromise. There’s something about Halloween that almost makes me wish I was a kid again. 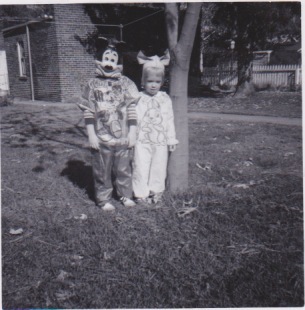 I remember when I was very young, and Halloween meant a trip to the local Woolworth’s to pick out my costume, back in the days when they came in a cardboard box with a clear cellophane top so you could see what you were getting. Later, I’d help carve the family pumpkin, and then we’d head out to trick our treat in the neighborhood. The best part was after trick or treating, when I’d come home and sort through my haul, eating as much candy as I could before my mom noticed what I was up to. When I got a bit older, my friends and I would piece together our own costumes from whatever we could find around the house. None of us had fancy costumes, either store bought or hand made, but we didn’t care. My favorite was when I put a black cape over a white sheet, and went trick or treating as Dracula’s ghost. By then the chief attraction of the holiday wasn’t so much the candy as it was a fun night out with my friends, telling jokes and trying to scare each other as we walked down the dark streets toward the next house. 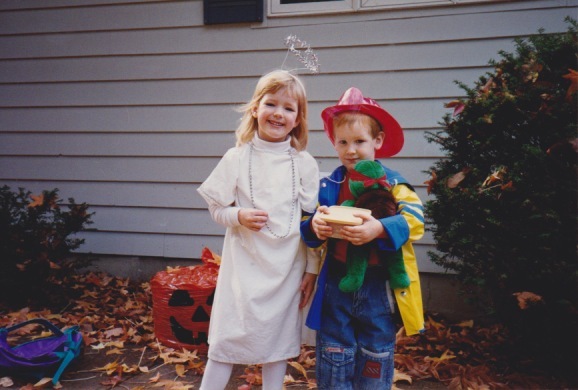 Later, when I had my own kids, I could revive a little bit of that Halloween excitement through them. I helped pick out or make their costumes (I wasn’t very good at sewing, but they didn’t seem to notice), enjoyed watching them in the school Halloween parade, helped with the class parties and took them trick or treating. But eventually my kids got old enough to trick or treat without me, and then stopped going altogether. Now I am middle aged, and I think I have just outgrown Halloween. I still put real pumpkins on my porch and set out a couple of ceramic pumpkins in my living room, but I can’t be bothered to string orange lights, stretch fake spider webs across my bushes or place crime scene tape across the steps. And I certainly don’t want to turn my front yard into a fake cemetery or put zombie figures on my lawn. I don’t believe that Halloween decorations should ever be graphic enough to scare small children, the way the the barbecue pit with a bloody Santa Claus head on it I once saw on someone’s porch most certainly would. I know there are lots of adults who still enjoy Halloween, and love the elaborate decorations and the Halloween parties that require costumes, and that’s fine. I’m just not one of them. My husband and I did go to several costume parties when we were newly married, and I thought they were fun, although my husband didn’t like dressing up. (One year he went as an Accountant, which he is, so that meant he didn’t have to wear a costume. And that was the only year he didn’t whine about having to go to a Halloween party.) But it’s been many years since I’ve dressed up on Halloween, and I honestly don’t miss it. These days my Halloween celebration consists of carving a jack-o-lantern, maybe making a few pumpkin-shaped sugar cookies and handing out candy to the kids who ring our doorbell on Halloween night. It’s true I don’t get the same feelings of anticipation and excitement that Halloween used to bring, but that’s okay. I believe that Halloween is for the young, and I’m no longer young. And I know I’m lucky to have a lot of great memories from when I was. For me, nothing marks the passage of time quite like the holidays. I tend to organize my year around them: if it is fall, then I know Halloween is near, and Thanksgiving isn’t far behind. The long dark days of early December mean Christmas is coming, the cold winter days of February mean Valentaine’s Day, and of course, spring means Easter. When I look back over the different phases of my life, I tend to measure them not so much by my accomplishments (no surprise there, considering what passes for accomplishments in my life), but by how I celebrated the holidays. And Easter is no exception. When I was very young, Easter meant getting a pretty new dress, shoes and often a shiny white vinyl purse, but what I looked forward to the most was the Easter basket full of candy. My new purse often came in very handy for smuggling a few jelly beans from my Easter basket into church, where I could enjoy them during the service as long as I wasn’t si tting next to my mother. She had an eye for those things. Later, as a teenager, I was part of a youth group that hosted an Easter sunrise service at a nearby lake. I hated getting out of bed so early, but sitting with my friends, watching the sun rise over the lake on a chilly Easter morning was an experience I still treasure. Then I had children, and the fun with Easter baskets and special Easter outfits started all over again. Now my children are grown, and their Easter baskets are more likely to be filled with small gift cards and scratch-off lottery tickets than with candy. I still go to church on Easter sunday, but only to the inside service that starts at a more civilized hour. Usually, my family is all together for the holiday, but not always, and I know that is a natural part of my kids growing up and moving on with their lives. Time marches on, and the way we celebrate holidays reflects that. But I do have one Easter tradition that has remained constant during the years: the annual dyeing of the Easter eggs. 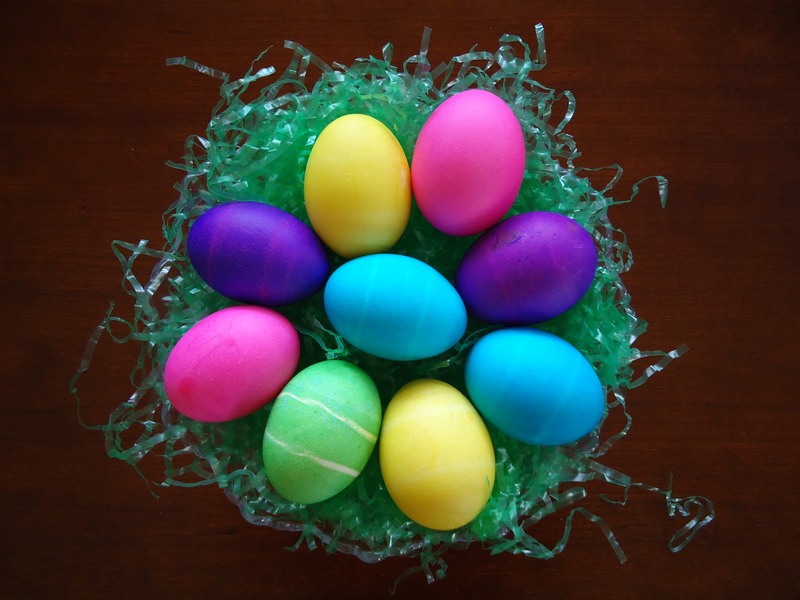 I did it when I was small, sitting around the kitchen table with my cousins and my sisters; I dyed eggs when I was a teenager and single young adult; I talked my husband into dyeing eggs with me even before our children were born, and I am going to do it this year, too. I’ve experimented with different types of dye over the years, but the basic routine has remained the same. Everyone, including the dogs, gets an egg with their name on it, and then the remaining eggs are dyed various shades of pastel with no swirling, speckling or other such silliness allowed. My daughter won’t be home for Easter this year, but we’ll still make an egg with her name on it. 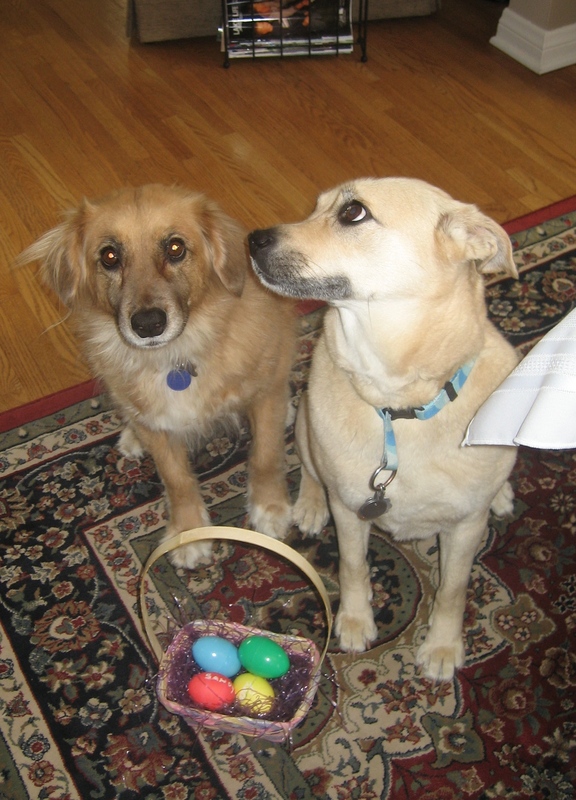 This year we’ll also have one less dog to make an egg for (rest in peace, sweet Sandy), but Lucy’s egg will be in her basket on Easter morning. I know that I can’t control the changes that time brings, and I know that the way I celebrate holidays will continue to change to reflect the current phase of my life, but as long as I can lift an egg and dip it into the cup of dye, I will do it. Because to me, it’s important to keep a few traditions going, and dyeing eggs is what I do at Easter.